Our research depends on partnership — with teachers, schools and other people and organisations committed to understanding literacy and its development. In recognition of this, we are pleased to announce the ReadOxford Partner initiative. It is hard to overestimate the fundamental importance of literacy for social and economic prosperity and advancement. Learning to read provides a young person with access to education and learning, to employment, to health and well-being and to culture; it allows them to contribute to and benefit from society. It follows from this that a greater understanding of how children learn to read, why some children might struggle and what can be done to boost and nurture effective learning is a priority for both research and educational practice. Our research is helping us to understand how children learn to read. But it can’t operate in a vacuum. We need input form teachers and education professionals to help us frame our research questions. We need to understand better what happens in classrooms, what characterises best practice in teaching and how we can work together to best share knowledge with colleagues working in schools. We’d like to build closer links with those who share our passion for understanding reading development, especially teachers and education professionals working locally in schools in Oxfordshire. Please consider joining us a ReadOxford Partner. Partners will be invited to workshops, seminars and discussion meetings. We will share our research findings at these meetings and electronically. In return, we would like to draw on your knowledge and expertise to help us make our research more useful and effective. Our aim is to create a multidisciplinary community in and around Oxford for those interested in literacy development so that we can share our knowledge and learn from each other. 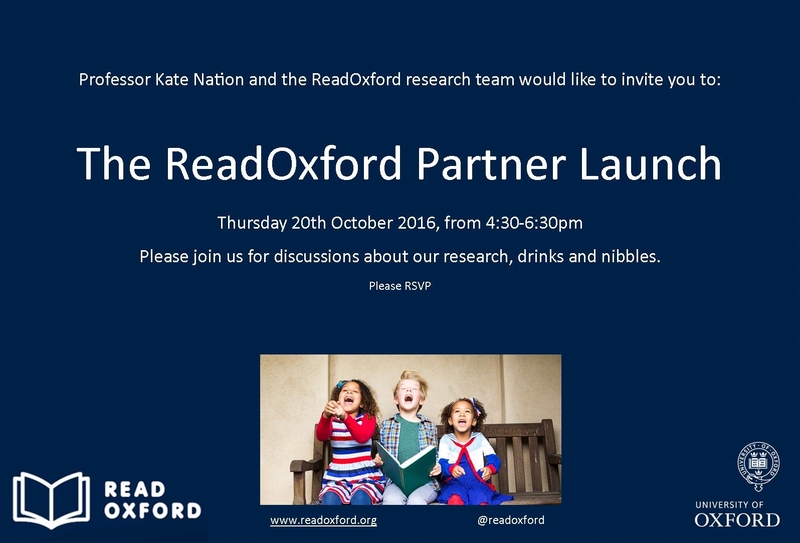 We’re launching the ReadOxford Partnership on Thursday 20th October. Please join us for drinks and discussion in central Oxford, 4.30-6.30: ideally timed for just before half-term and therefore much needed wine! All are welcome. We hope to meet with Oxfordshire teachers, literacy and language co-ordinators, SENCOs and school-based Research Leads — but anyone with a commitment to enhancing literacy development is very welcome. If you’d like to attend, please email Helen Norris, including your name, role and and affiliation. We will then send you details of the event and add your name to the invitation list. Places are limited so please RSVP as soon as possible, and before 4.00pm on Monday 17th October. Whether you can come to the launch or not, if you would like to become a ReadOxford Partner, please apply using the form below.